Take a "deep intellectual dive into the heart of a controller for a moment. Its OK if you don't get it, if you do that even better. The motor has three circuits to energize known as phases which "commutate" or switch on and off to force the motor to rotate. That's what drive the forces of the stationary electromagnets to attract or repel the series of magnets rotating in the hub. The top three lines in the Trapezoidal column represent the voltage waveform of a Trapezoidal Driver. 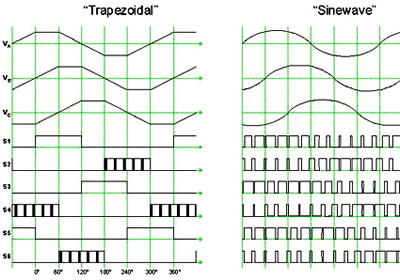 Trapezoidal waveforms are rather abrupt and cause tiny vibrations which produce more audible noise. Likewise the top three lines represent the voltage levels of a Sine Wave Driver. Much less abrupt meaning they generate much less audible noise from the motor. Sine Wave Drivers are just beginning to reach the efficiency levels of Trapezoidal Drivers and will eventually become the Driver of choice. Enough of the deep dive; the important point is that there are two different Drivers and as the Sinewave is not yet mature it has higher cost and a few bugs to work out on meeting the efficiency levels of the Trapezoidal in the present time. Timing for the commutation or switching to each phase has to be mighty precise. Two ways to manage the timing; Sensored or Sensorless. Sensorless timing simply measures the current flow to each phase; as the magnet passes the electromagnet it creates a ripple which is detected. Sensorless is not nearly as accurate at hitting the timing points as the motor reaches higher speeds. It works OK on a Direct Drive but as rotation speeds are much higher on Geared motors the efficiency and power begins to fall off. Therefore if you have a Direct Drive you may be able to use the Sensorless Controller functions an not worry about those extra 5 connections to the Controller from the motor. Moreover as the Hall Sensors are usually the first thing to fail inside the motor, a Sensorless system becomes more reliable. Switching inside the controller is handled by Field Effect Transistors. You'll see various ratings on these as they are very critical components that handle the bulk of the power, and generate some heat every time they are switched on. IR 3077 FET's are by far the most efficient; these can extend the range by about 3%. They have an upper voltage level of 60 volts. Strongly recommended if you have the choice. The number of FET's determine how much current the Controller can handle. 6 FET's can handle bursts of 40 Amps but really shouldn't exceed 25 Amps. If you're trying to climb hills with a Direct Drive go for 12 FET's. Controllers may be Internal to a Direct Drive or Mid Drive or external which gives the buyer an option to select which controller to use. External controllers give the buyer a choice but its wise to choose one the motor supplier offers that already has mating connectors to the rest of the system. External controllers often have added features (with more connections) such as reverse switching (for Direct Drive only) and Cruise Control. Some of these features may also be managed inside a Display/Computer unit that control the Controller through the Throttle Input Circuit. There are no standards that enable Controller A to work with Display B so these units should be matched somehow to be compatible. 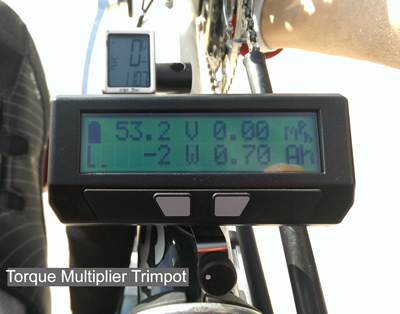 All Controllers will have some form of throttle input, usually a 0-5V signal input to control the speed which is about the only standard due to the available electronics. Turnkey systems such as the Bionx and Bafang BBS02 require their exclusive Display/Computer which sends signals to the Controller; these systems make the Controller a Slave or "Dumb Controller". Golden Motor has developed a Bluetooth interface that allows an Android Phone to serve as the Display while retaining a "Smart Controller". Infineon Controllers can be configured as either a "Smart Controller" or "Dumb Controller" depending on the user's needs. These units are also programmable as are the Bafang and Golden Motor Controllers. You may not need to program these systems, but that ability doesn't force the user to deal with less than optimal settings like some restrictive units do. Most Display/Computers are specifically paired with as part of a Turnkey drive system. For example it would be impractical to try to connect a Golden Motor Display to a Bafang Mid Drive; sure it could be done once you figure out which wires go where, just impractical. However there is one Display/Computer that's somewhat universal and well documented, the Cycle Analyst. Current Consumption/Watt Hours used, etc. Grin Technologies also carries a line of Infineon Controllers with compatible connectors for the Cycle Analyst.